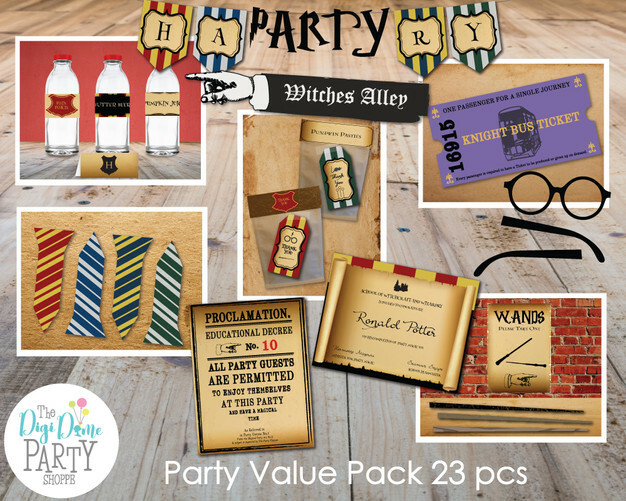 Most of the party printables packs from The Digi Dame Party Shoppe contain at least one printable party banner. 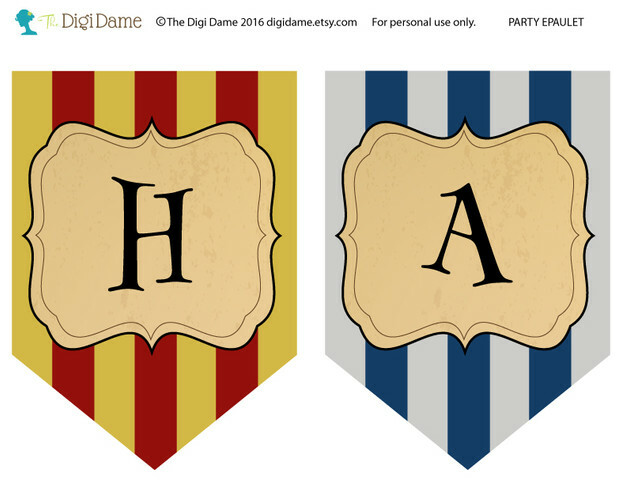 Each banner page contains two banner flags, as shown above. Depending on the pack, some of these are editable PDF files, some are non-editable PDF files and some are non-editable JPEG files. 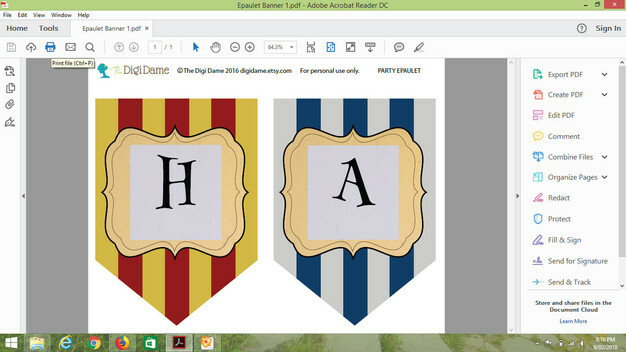 In this tutorial, we will be discussing how to create your party banner - from opening the file in Adobe Reader, through to assembling the banner flags after printing. 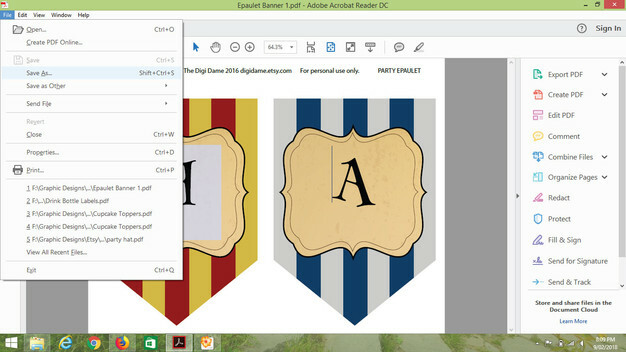 The editable PDF files include text fields for you to personalize the banner by adding your own Letters and/or numbers. All required fonts are embedded in the PDF file as well as text sizes and colours. If you have purchased a banner that is not editable, the instructions on printing and assembly will still be helpful to you, so read on! The example we have used here is the epaulet banner from our Wizard Magic School Party Printables Pack. 1. 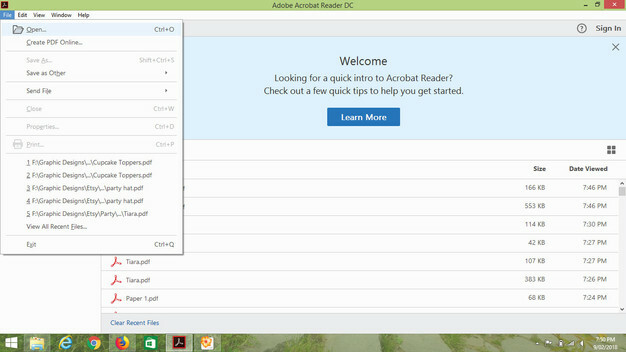 Open Adobe Reader by double-clicking on the icon on your desktop. 2. Choose File > Open and choose your file. Click Open (see images below). 3. You will see the editable text fields that are highlighted in blue boxes (see below). Our sample text will usually be visible in these blue boxes. Note: On some systems/versions, you may need to click on the "Highlight Existing Fields" Button in the top right corner of the screen. This will highlight the text fields in which you can begin typing. 4. Highlight our sample text by clicking and swiping over it. Then you can either click on your delete button to clear our text, or simply type your own text over the top of our sample text. As you begin typing, your text will appear, as below. Make sure your text fits inside the box, or it will not be visible when the file prints. To edit your file, change our sample letters to your own letters required to make your banner message, as shown in the image below. 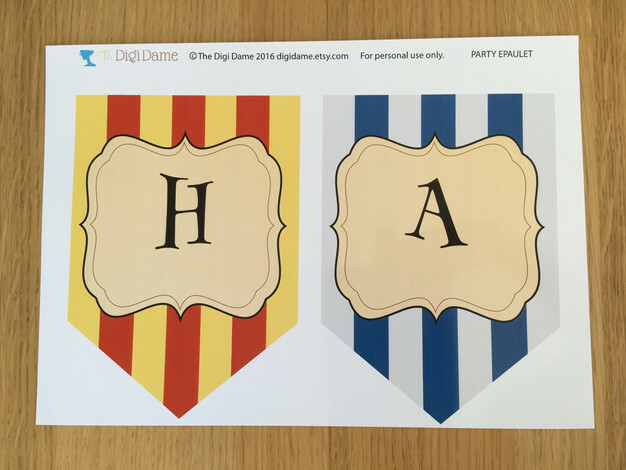 You will need to edit the two flags on each page and save each file one at a time. This method is ideal if you are having your items printed professionally, as it saves the number of copies needed. 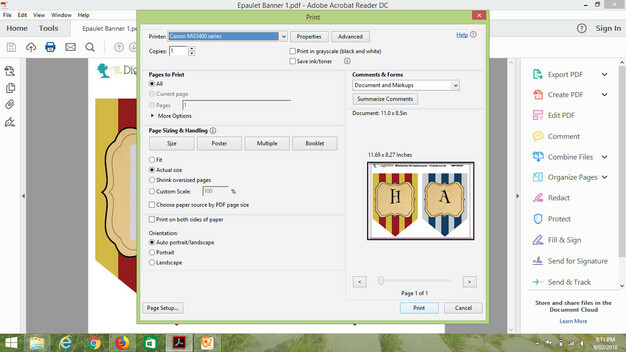 Alternatively, if you are printing at home, you can edit and print each individual page required to spell out your banner message in order as you go e.g. edit and print H&A, then edit and print P&P, next is Y&B and so on. Note: The highlighted field boxes will not print on your files. But if you wish to remove them, click Preferences > Forms > Highlight Color and untick the box that reads Show border hover color for fields. 5. To save your edits, Choose File > Save As (as image below) and choose a location on your computer to save your edited file (next image). Choose a new name for your file, so you know that it is your edited version. Click Save. Note: Only the latest versions of Adobe Acrobat Reader (Version 11, DC or newer) have the ability to Save Edited files with MAC & Windows. 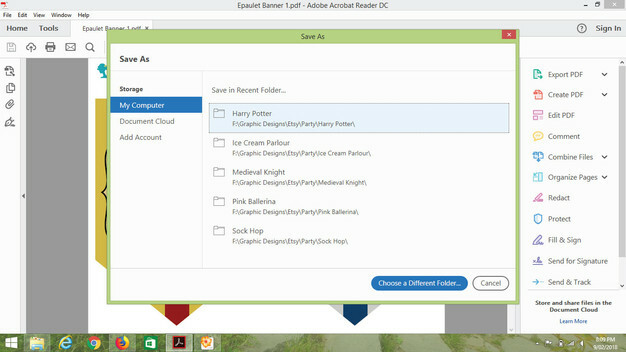 If there are no Save or Save As options under the File menu, then you are using an earlier version of Adobe Acrobat Reader. 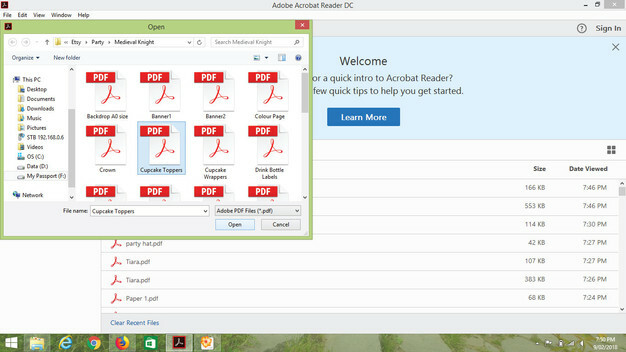 You can only save files in PDF format using Adobe Reader, which is the same format as the original file. Remember that you will have to save and/or print a banner for each of your required letters to spell out your entire message. 6. To print, Choose File > Print or click on the printer icon, as shown below. Choose your paper size and type, number of copies and any other properties that you want, and remember to choose Actual Size. Click Print. 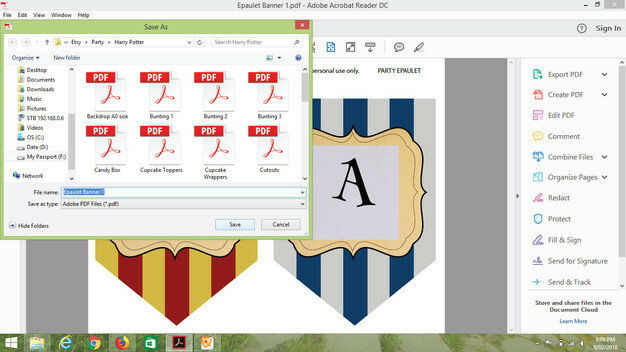 Your banner files will print with two banner flags on each page, as shown below. 7. 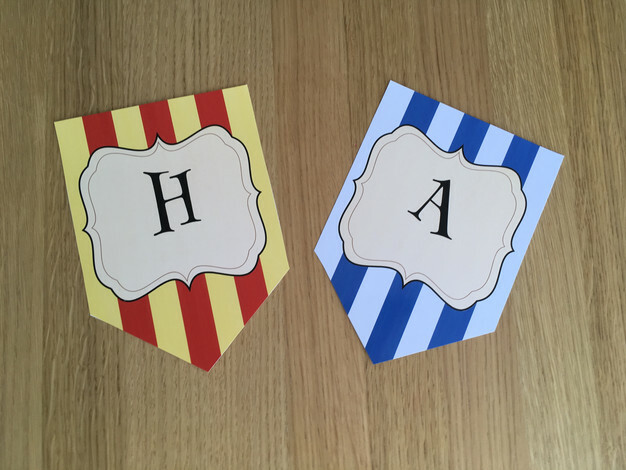 Cut out each of your banner flags using either a paper trimmer or scissors, as shown in the image below. Next, use glue/tape/staples to attach your banner flags to string or ribbon, or hole punch the flags and thread the string through to hang. You can hang your banner on a wall, along a table front, across a doorway or window, mantelpiece...anywhere you can think of. And you can create as many banners as you wish! We hope this tutorial has been helpful. You can find more tutorials via a search here on the blog. Full instructions are also included with each of our party printables products. We have a host of other tutorials on our blog, including how to use our cupcake toppers, here. FREE Easter Party Invitation - Download Instantly!